The 2010 Masters Tournament was the 74th Masters Tournament, played April 8–11 at Augusta National Golf Club. Phil Mickelson won his third Masters and fourth major title, three shots ahead of runner-up Lee Westwood. 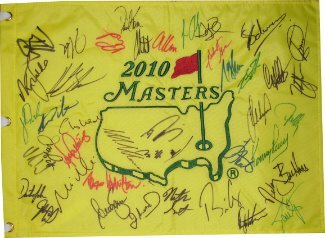 This 2010 Masters 18x13 Flag has been hand signed by 40 Golfers including: Stewart Cink, David Duval, Nick Faldo, Steve Flesch, Brian Gay, Hubert Green, Nathan Green, Bill Haas, Todd Hamilton, Ryo Ishikawa, Miguel Angel Jimenez, Dustin Johnson, Zach Johnson, Jerry Kelly, Anthony Kim, Justin Leonard, Hunter Mahan, Matteo Manassero, Ryan Moore, Kevin Na, Sean O'Hair, Louis Oosthuizen, Jerry Pate, Kenny Perry, Alvaro Quiros, John Rollins, Rory Sabbatini, Charl Schwartzel, Heath Slocum, Nathan Smith, Craig Stadler, Henrik Stenson, David Toms, Nick Watney, Mike Weir, Lee Westwood, Oliver Wilson, Chris Wood, Ian Woosnam, and Y.E. Yang. Beckett Authentication Services Hologram #A84662 and Full Letter of Authenticity.